Members of the Galena Winter Drumline practice their routine for their competition. The Pride of Galena High School Winter Drumline competed in their first contest of the 2018 season at Kickapoo High School on Saturday, March 3. They received second place in their division, behind Reeds Spring HS. The Winter Drumline is composed of students in High School and Middle School from Galena. Their show “The Hands That Move Time” with original composition by Jonathan T. Martin, includes multiple tempo and meter changes, that all happen seamlessly without a conductor in front of the ensemble. Jonathan Martin, who wrote the music for Galena’s show and designed the visuals, believes that it’s an accomplishment to just have the opportunity to perform. 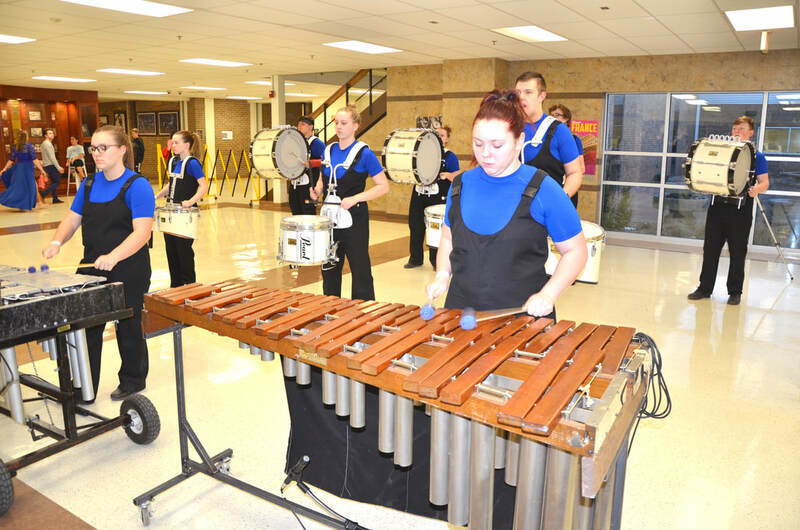 “With it being the first year of Winter Drumline at Galena, it’s quite a big deal to have something to present that stands up to the competition and other presenters at a contest like this,” said Martin. Galena competed in a class with schools more than twice their size, including Reeds Spring and Webb City. Other schools that performed throughout the day included Joplin, Kickapoo (Springfield), Republic and many others. This is the first year that Galena has had a Winter Drumline, and is also the only school in the SWCL conference to have a Winter Marching Program. ​The GHS Band Boosters are always looking for help from the community to continue to provide programs like this for students. If you are interested in becoming involved in the Galena HS Band Booster program, contact Mr. Philip Thomas, Band Director at Galena High School, or the Galena High School Band on Facebook.